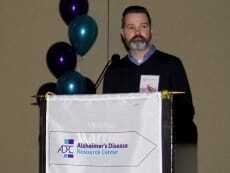 Dr. Scott Noggle, Director of the NYSCF Laboratory and NYSCF – Charles Evans Senior Research Fellow for Alzheimer’s Disease, presented the latest in Alzheimer’s research at the Alzheimer’s Disease Resource Center’s (ADRC) 10th Annual Alzheimer's Disease Education Conference & Expo. Dr. Noggle gave a talk on the ability of stem cells to model the disease ‘in a dish’ and the implications of this technology on Alzheimer’s research and potential future treatments and cures. The event was held on March 6th in Melville, NY.